Devon is "sailing" through 1st grade with lots of smiles! But days were not always this carefree for the Shepherds. 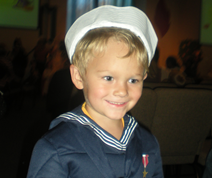 Shortly after his 3rd birthday, Devon was diagnosed with a seizure disorder. The uncertainty of what triggered the seizures brought us to our knees. We were praying for answers. Then we found hope in a can. Adding this optimal nutrition to our routine was convenient and delicious. Devon is playing hard, riding bikes, and swimming with his friends every day. All of the Shepherds have experienced great wellness since starting this complete nutrition. Clayton, 17, has no allergy symptoms for the first time in his life. Kathleen, 13, has great stamina running and dancing for hours each day. Six hours away from home at St. Bonaventure University, Shannon is experiencing a sense of well-being for the first time and knows that if something crops up, "two shakes a day is the Shepherd way!" Our college freshman Christine was not sick once this entire school year, and when stress was high, she kept her shakes near by. Our family really can't put a price on our improved health. Devon's friends at his mom's at-home daycare are feeling great too. The kids at Miss Maureen's, with their parents' approval, are enthusiastically drinking chocolate, lemon, orange, and cool punch shakes and loving it. Miss Maureen's daycare has never been healthier or happier. Mom, Dad, Maureen, and Clay have never felt better. We just don't worry about preventable disease as we feel great and keep up with our young family. Clay works for the Navy and travels the world. He has had welcome relief from allergies and joint pain. Our immune systems are all so strong now. We are able to avoid so many of the day-to-day issues that families struggle with all around us. We have energy to burn all day long. Moreover, Clay never leaves town without packing his shakes. This company is providing great financial support to the Shepherds as well. We are able to squeeze the business in around five children, a home daycare business, and a traveling husband. We are sharing this superior nutrition with those we love and care about and helping them with their health and finances. This additional income is helping pay for dance lessons and braces, and we finally have a plan for paying for college tuition, which gives us another reason to be thankful for hope in a can. If you are interested in optimal health for you and your family, if you'd like to be your own boss and live life on your own terms, and if you want to work with a solid company with a proven track record and unlimited opportunities for growth, then hope in a can is the right choice for you. Contact us to hear more real-life success stories and to learn how we are changing lives for the better every day. We invite you to check back often to see what is "Shakin' with the Shepherds."